Philip describes ‘Pip’s Tumbling Blocks’, a quilt he made using scraps of fabric, which his daughter declared she wanted it when she first saw the quilt. It was inspired by a photograph he saw in an encyclopaedia and worked out how to make. 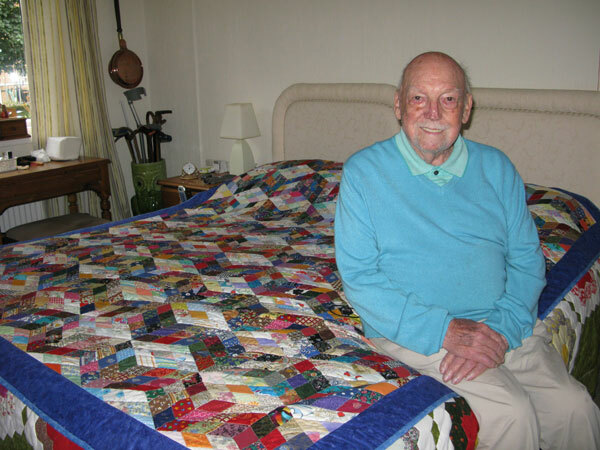 Philip started quilting after his first stroke and was initially inspired after seeing a local exhibition of quilts. 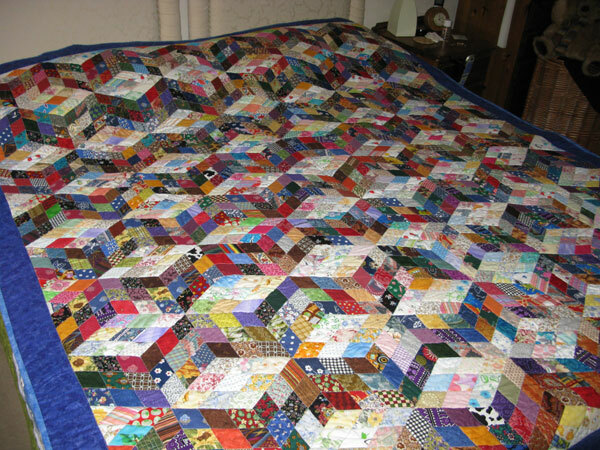 He talks about the pleasure and benefits he gets from quilting, particularly English paper piecing, as well as describing how quilting fits into his life. Philip talks about the support he has from his family and his frustration at people thinking they are too old to try a new hobby. Christine Burgess [CB]: [Interview introductions] First of all I would like to thank you for agreeing to be interviewed about your craft. If at any time you would like to stop please tell me and we can stop and resume when you wish. Phil has asked me to explain he has had three strokes and his speech is not as it once was, but I don’t think we need to worry we’ve have had a chat and it seems to be fine. As I said please say if you wish to stop and we can continue at any time after. We are in the community room and it’s possible we may get someone saying hello! 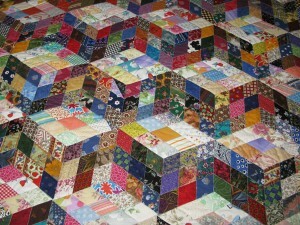 Tell me about your quilt that you’ve chosen, your touch stone object, named ‘Pips Tumbling Blocks’. Phillip Williams [PW]: Well all of my children since I have taken this up all want a quilt from me so this is for my eldest daughter, I have about three or four more to make so hope I live long enough to do them. The whole thing fascinates me I can’t stop doing it so it’s not a chore its more of a pleasure to do… I never thought I’d be [repeats] be doing this sort of thing but I just wish I discovered it about thirty years earlier. CB: Where did you get the idea for this particular design? PW: Well this particular one I saw in a picture in an old antique book, was done not the same colours but the design by a… a woman in America in 1875 and I thought, I looked at it and I thought I must do it, my wife thought I was mad but… I persevered and got through it quite pleased with it my eldest daughter saw it and she said ‘That’s mine’ and that’s how it came about. CB: So did it have the measurements in the book? PW: What, that all it had actually was the length and breadth of it, what I did I counted the amount of pieces across and down and then worked out with a pencil and paper the size of the pieces then I set to work cutting them out accordingly and sewing them together. That’s all I had in the way of dimensions. CB: Why these fabrics and where did you get the fabrics from? PW: Well a lot of the fabrics well actually scraps from things people had thrown away little bits and pieces Id picked up here and there it wasn’t a set out thing I just got light, darks and mediums, colours and just tried to arrange ‘em in some semblance of order according to the picture I saw in the encyclopledlia… pedia. CB: Lovely – when you started making it did you know who it was for? PW: No not at the time I just wanted to make it ‘cause it fascinates me when I saw this old picture I thought just lovely to have a go, then my daughter, eldest daughter saw it and immediately put her name on it [laughter] ‘that’s mine’. CB: How did you get into quilting? PW: I got into quilting just after I had my first stroke I was in Dartford and I saw there was an exhibition going on in Dartford and I said to my wife ‘Let’s go in and have a look’ which we did and immediately I was fascinated by all the… colours and everything others so I said to my wife ‘I must have a go at this, this looks like something that would occupy me.’ Because I couldn’t go out and play golfing anymore which was my obsession at the time, I missed golf but not now, it’s taken all that away. I’d like to be fit enough to play but this is certainly…. given me a great interest in life and something to work for and live for and do and hopefully learn more about it. I just wished I’d discovered it about twenty years earlier. CB: What do your family think about your hobby or as you put it to me obsession? PW: Oh, they’re all quite surprised at how [repeats] how I’ve got on with it, I have done other handy crafts in the past wood carving, wood turning and things like that which I enjoyed but it never became like this… an obsession I just used to do something. I liked… earlier in my life I did knit to help June knitting and making things for the kids and I enjoyed that, but this is, well it’s like a full time job, I get up in the morning, get things done and then spend the rest of the day sewing, so it’s just taken over my life really. CB: So do you sew every day? PW: Yes oh every day, I [repeats] I spend about a minimal of about six hours a day, minimum sometimes a lot more, I get told off by my wife cause I’m very often still at it two o’clock in the morning… but I sleep well then and then get up and do some more, but I like to spend every minute I got to spare quilting. CB: So do the fabrics draw you to them? PW: Oh yes I’ve been up to a lot of these fabric sales and I’m fascinated with the colours and designs on some of the fabrics they are most interesting. I think the people that design the patterns and so on on the material are amazing its art unto itself, I think so. But [repeats] but I like doing and using scraps I can’t stand it when I see people throwing a bag of scraps and material away I think to myself maybe I could do something with that, which I have done, this is one of them. CB: Is there a particular colour you don’t like? PW: [Pause] No I don’t think so cause I think all colours used in the right concept have a part in this it depends how you use it I couldn’t say, oh I couldn’t, wouldn’t do anything with that, [repeats] with that, I don’t like it I never found that. There’s a place for it all somewhere in this world in the world of quilting, it can be used. CB: Do you mind that there are so few men in this craft amongst all the women, tell me what happens at quilt shows. PW: Well to me, it doesn’t bother me at all because when I go in anywhere and you say I’m a quilter, I get good attention and they’re always very pleased a man is doing it. I would like to see other men doing it because I think if they had a go and found out some of the things involved in making them they would get quite interested, but no it doesn’t… I like to see them doing it but it doesn’t bother me if they choose not to. CB: In the questionnaire you completed for me you describe yourself as a ‘Hexie’ can you tell me what that means? PW: Well I’m, I think the, the hexagon shape is so fascinating there’s so much you can do with it and I spend a lot of time on the internet look at other peoples work and I came across a thing ‘The Hexies’ that’s and I thought that’s it I’m one of those, but I do like other shapes but hexagons I’m trying at the moment to get ‘em down as small as I can and I’m now down to half inch hexagons its fascinating, it’s such a simple shape but it’s so versatile what you can do with it but that’s a bit… just a bit of my madness [CB chuckles]. 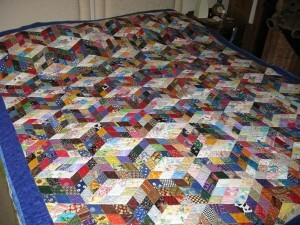 CB: Are most of your quilts made using the England, English paper piecing method i.e.? PW: Most of what I’ve done, yes I find it more… you can get your pieces out more accurate doing that method. My hand sewing has certainly improved quite a bit doing this my stitches are small and it gets you to use your hands and makes your fingers all more supple and usable ‘specially when you get at to my age. I think it’s like an exercise with doing something that you like doing its good for the joints…. PW: Oh well, what’s left of it yes [chuckles]. CB: Well I can see you have to work out the designs they’re quite meticulous designs that you’ve chosen to do with your quilts so I think you probably use your brain quite a lot. PW: Well, I try to I try to imagine things… I’ve forever got bits of paper in front of me and drawing out different ideas that’s the fascinating part about it. You, working out shapes and sizing and putting together to create some…there’s a lot I’d like to do but whether I’ll get around to mastering it all I don’t know but I will keep trying whilst I’ve got time left on this earth to do it I shall keep trying and trying to improve. Off-hand all the quilters I met all round not only the members of our group but others as well, they’re, everybody is so helpful its… I found it more with this than I found with any other interest I have… they’re all very, very ready to give you all the help that they can manage. [Children shouting in background]. CB: So in your working life were you an engineer is that why you’re fascinated…? CB: So were you an engineer by trade it that why you are interested in geometric designs? PW: No… most… I spent a lot of time in the forces as a nurse when I came out I ended up really doing sales, was something I was quite good at and ended up as as sales director for a company I worked for so my interest in shapes and everything has got nothing to do at all with my work it’s just an interest. CB: How do you sew them together, do you over-sew them or have you got a special stitch you use. PW: Erm. No I don’t I like… when I sta.. first started them I over-sewed them then I picked up little bits on, on the internet people doing different ways and I now sew them holding the two pieces together and sewing down the side so they don’t see the stitches on the top. But when I started I did stitch most of the pieces now I don’t it makes it better for finishing and stitching like things, and stitching in the ditch cause you’ve got a line to work to it doesn’t interfere with it. I try, I love watching things on the internet and cause you see so much on there. It’s like going to school and you just watch it whenever you want to time and time again and you see many useful tips on there and inspiration I think it’s… it makes it more interesting just want to learn and pick up as much information as I can cause I’ve got a lot more to do to keep my family happy. CB: So do you quilt by machine or by hand? CB: So when you’ve completed a quilt top how long does it take you to take the paper out? PW: Ah! That’s one job I given my wife to do because she got cancer and can’t severe arthritis she can’t get around much so she sits and helps me and she takes out all the paper pieces, in fact she now insists on doing them, but I don’t mind. That helps me I can get on with something else while she’s doing it. CB: [Pause] Can you describe a typical day or week in your quilting life. Do you actually I know you said earlier that you sew a minimum of six hours a day but do you… sort of if you are planning a quilt how you go about planning a quilt in your busy schedule. PW: Well once I’ve worked out whatever I want to do I just… I cut out all the bits and pieces cause in addition to doing all this I have to do all the cleaning cooking and housework because my wife is hardly able to do it so that is part of the part of my time in the day otherwise I would only be spending only about fourteen hours a day if I didn’t have those jobs to do but It’s all part of life’s rich pattern and doing these things but no once I’ve done all of my chores I then if we are not… if I’m not taking my wife out then I sit back and sew, it’s just that’s it. CB: Do you ever have a piece of fabric that you just can’t bring yourself to cut into? PW: [laughs] Yes, funny you should say that… I have a piece of material which after we’ve finished talking about it I will show you it’s an enormous piece of material and quite frankly I don’t really know what to do with it. Somebody brought it back from Bali it’s a beautiful piece of material and as I said it is huge so I don’t want to spoil it I got something, I shall need some help which I know I get from the people at the quilters club and so on but I will want some advice or what I may be able to do with this. Its mainly gold fabric buts it’s like a lot of the fabric from Bali it’s magnificent but no that’s the only piece at the moment I’m afraid to put scissors to it until I get some advice and help from some more experienced people. CB: Tell me about when you were a child and passing a tailors shop in your home town. PW: Well when I was… I left school at fourteen I used to pass a little shop which was run by a Jewish tailor he used to sit in the window sewing and I used to stand and watch him. He did invite me in one day and said he was wanting an apprentice which I was interested but my mother had different ideas about me working for a Jew which I never forgave her for. Well it was job I would had liked to have done so there I was possibly an interest in that sort of thing right from the time I was fourteen but as soon as I was seventeen I left home and joined the Royal Air force and didn’t see my mother again until I was twenty six. CB: Gosh – I understand you have been making quilts for just over six years and I know you said you came to the exhibition what, what helped you get into it from that exhibition? PW: Well I was I couldn’t drag myself away from there and I expressed it sort of fascinated me and when I saw all the shapes on the material its put together to create such wonderful designs and patterns. I expressed an interest in it to one of the ladies at the exhibition and she said well the amount the membership thing was full at the time but she would take my details and a week later I did have a card from them inviting me to come up with a view to joining the group and its gone on from there. CB: Good [Pauses for children chattering in background]. What would you say to someone who thinks they are too old to start? PW: [People talking in background] That’s the most annoying thing I hear in my life I can’t stand it when people say ‘Oh its very nice but I’m too old to do this. I think if you do, do it, it will improve your life and possibly extend it as well. If I can do that as a man started at eighty I’m sure some of these women could do a lot more than I’ve done ‘cause they’ve possibly had more experience sewing bringing up their families as such, but I hate anybody not only with sewing but with anything at all – I hate that expression – very nice but I’m too old to do that, that’s is the worse thing I think you can say. It’s just not true you’re never ever, ever, too old to try and do anything. PW: Well it’s something I enjoy doing interested to put together, it occupies my hands my brain what’s left of it and so I think it’s just something It’s like a therapy and they’re all on about for elderly people especially try and do things and I think it would improve at lot of peoples life and the lengths of time they live if they keep themselves occupied in that manner. I know from experience having the strokes my doctors and specialists I go to see from time to time had noticed the difference in my attitude to life cause at one point I thought it had come to an end but this did save it and I think it would save a lot of other peoples doing something of this nature not necessary quilting but anything in that line to get your mind working and hands as well at the same time. PW: Oh yes I do love crochet I must admit it I get I wish I had more time to spends cause quite a lot of people the pieces I’ve seen I would like to do, but I really haven’t got the time and doing my quilting and quilting is the number one! But crochet yes as, if I couldn’t do this anymore but I could use a crochet hook I would be back on crochet, again I like to do things with a challenge, I made three full size crochet quilts fine very fine material one of those did win a competition and all… I obviously liked the remarks I heard when they were say they said ‘Oh its made by a man’ [laughs] as if there’s something amazing about that, but I think all men are capable of doing it if sit down and have a go, they have done in the past with wounded people as therapy to get your hands and minds working together but no crocheting would be my number two to do if I couldn’t do any more of this [PW touches the quilt]. CB: So is it the fabrics and the colours that make this number one for you? PW: Yes I think the… when I see pictures or different things I see things they are usually a bit of a challenge when I see something and I thought that looks worthwhile having a go at and so far they’ve all come out quite well, but I do like a challenge in and seeing some of the things I’ve seen in magazines and internet and other members of the Guild I been amazed at what you can do with small pieces of material. PW: What next well I got several things to make but my real obsession when I went to an exhibition at Birmingham was the Tentmakers of Cairo and I would love to attempt some of the stuff they’ve done I got some, it won’t be as large but I want to have a go at creating a wall hanging of some sort in using their methods and designs because I do love the geometry and everything of a lot of Islamic art they use a lot of these shapes and sizes quite a lot and they came out with some fascinating designs so if I get the chance I want to have a go at that. But at the moment I am very content doing what I am doing I hope I get all my ones I want to get completed for my family before I shuffle off to the next world. CB: So who are you making one for at the moment? PW: I’m making one for my granddaughter which is ready now to be quilted its all finished the top and then I got another one my youngest daughters coming and showed me what she wants that’s a big one so I got those to do so I think I got enough for… me to take me into a couple of years. I do once I start one I don’t stop until its finished I know some people I’ve heard have taken two or three years to get one completed, but then they are probably people that probably got families to bring up and children, so the time is possibly as much as I got that’s the one thing I got on my side but I shall be busy until I go, that’s a fact. CB: Phil your story is so interesting, thank you so much for sharing it with us. The time is now two minutes to three and the interview is ended. Thank you ever so much. PW: It’s been a pleasure.